This is a brunch you’ll want to enjoy time and time again, particularly as it’s so simple to make, requiring just four ingredients and just 10 minutes to make! 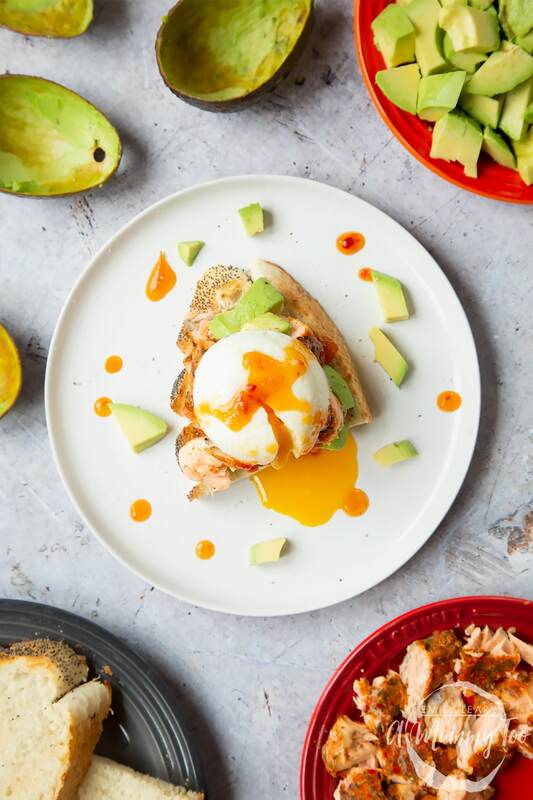 The crisp, fluffy toast is piled high with deliciously sweet, spicy and succulent salmon and creamy avocado, a perfectly poached egg boasting a luxuriously custardy egg yolk, and a final drizzle of sweet chilli sauce. Everything tastes extra special. And the secret to making such a delicious meal so quickly? 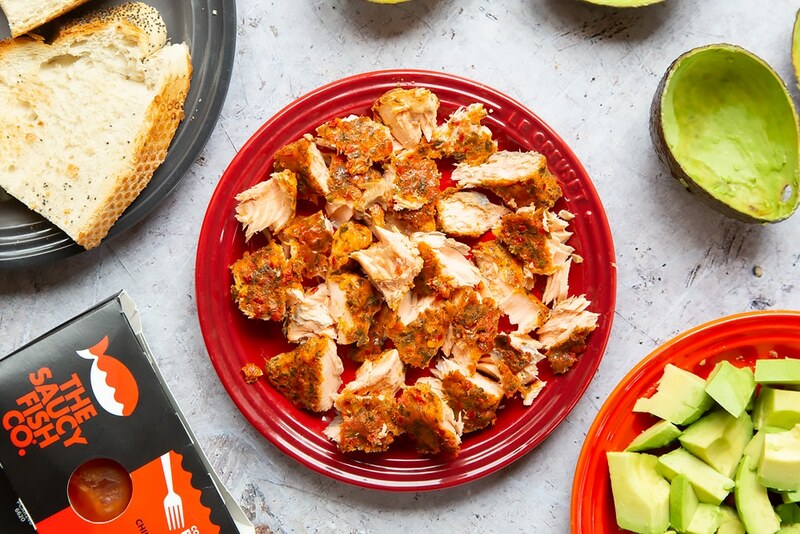 The Saucy Fish Co. Cooked and Ready to Eat Tomato & Chilli Chutney & Sweet Chilli Roasted Salmon, which recently won Gold in Healthy Food Guide’s Best of Health awards and is available from Sainsbury’s and Ocado as well as from The Saucy Fish Co. online shop. 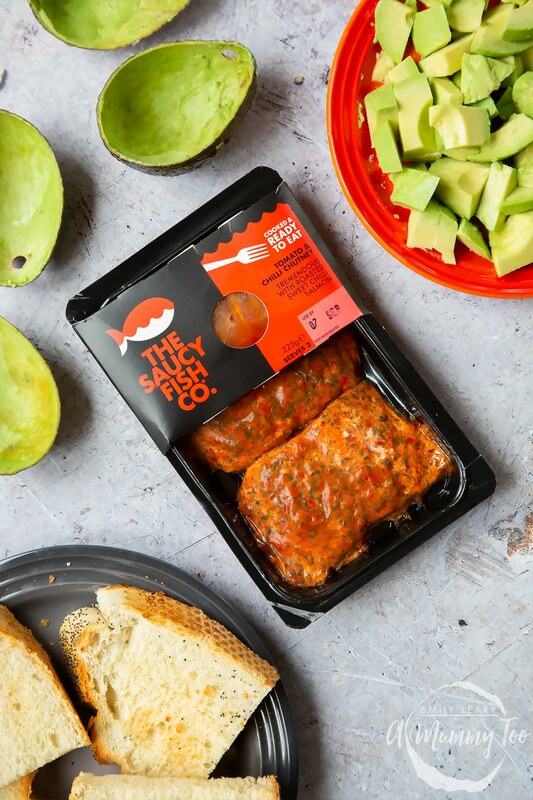 If you haven’t heard of The Saucy Fish Co. then now is the time to hunt them down at your local supermarket, because they specialise in a range of fresh, frozen or ready-to-eat fish products that, as you may have guessed, all come ready prepared alongside a fantastic sauce that will complement the fillet or fish cake perfectly. 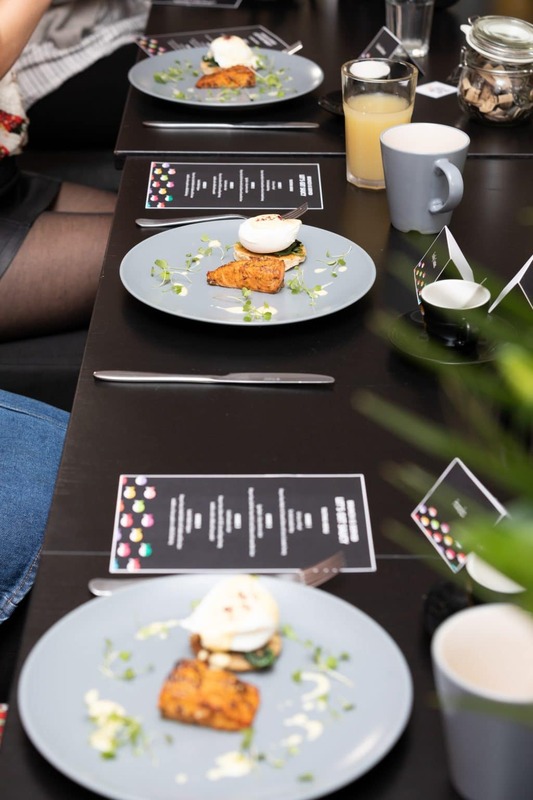 My inspiration for this avocado toast brunch recipe, in particular, came about when I headed over to Manchester to enjoy brunch with the Saucy Fish Co. team and some fellow food bloggers. 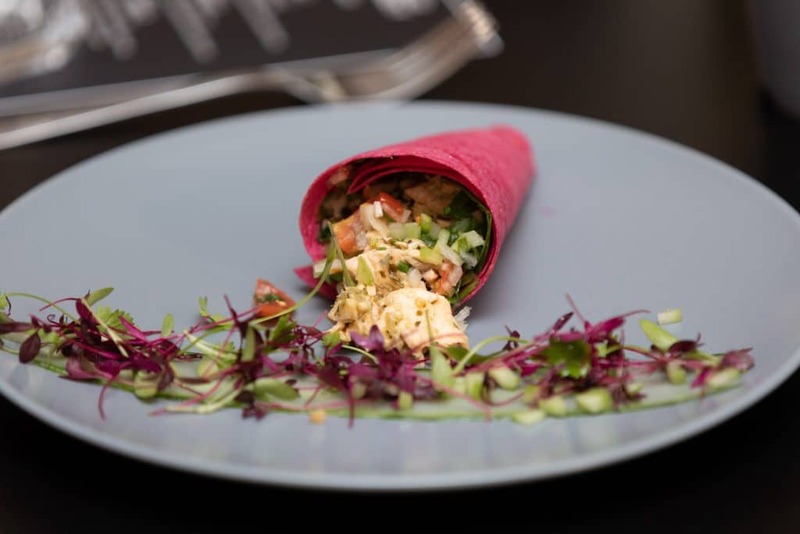 A breakfast wrap filled with a citrusy cucumber and tomato relish and The Saucy Fish Co. Ready to Eat Steamed Salmon with Lime & Coriander Dressing. Eggs royale featuring The Saucy Fish Co. Cook from Frozen Herb Crusted Salmon with Lemon Butter Sauce. Avocado toast with The Saucy Fish Co. Salmon with Chilli, Lime and Ginger Dressing. Smoked haddock kedgeree featuring The Saucy Fish Co. Smoked Haddock with Cheddar and Chive Sauce. In each dish, the fish was used creatively to elevate a classic brunch dish, so that’s what I’m showing you how to make today. 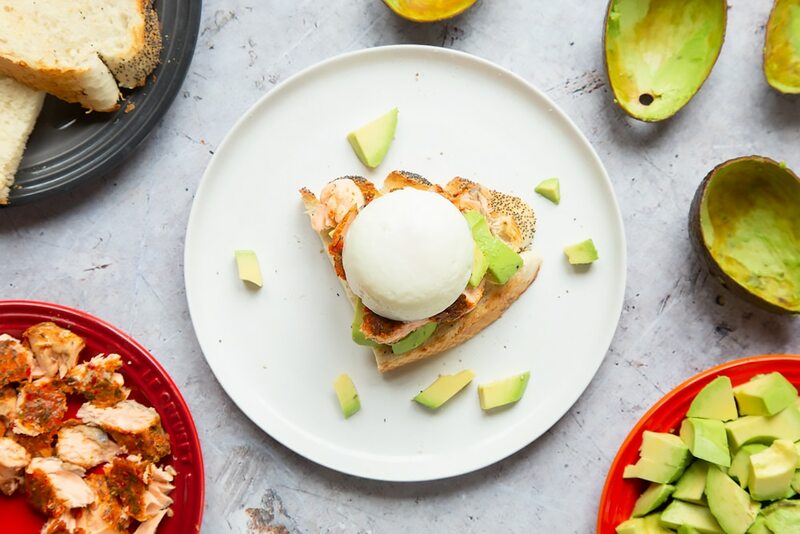 So let’s make a 4 ingredient, 10-minute avocado toast with roasted sweet chilli salmon brunch. 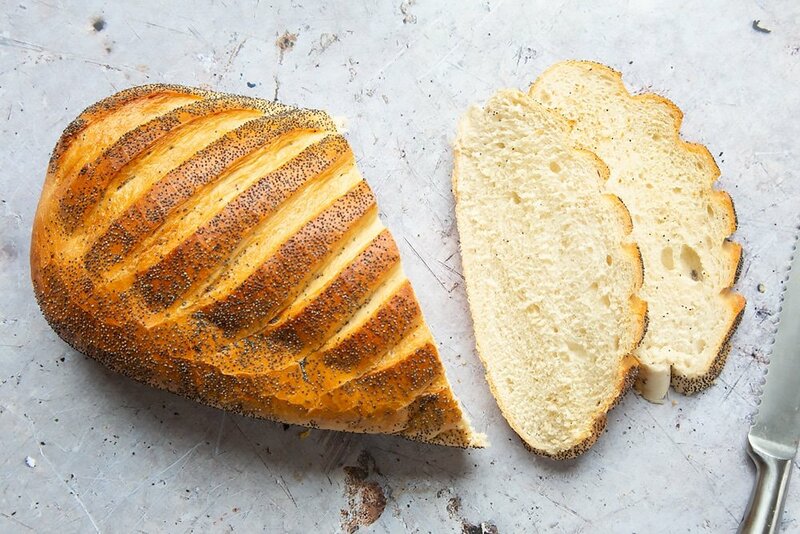 Slice the bread thickly, toast and cut in half. De-stone, peel and dice the avocado. Fork the salmon into pieces of a similar size to the avocado. 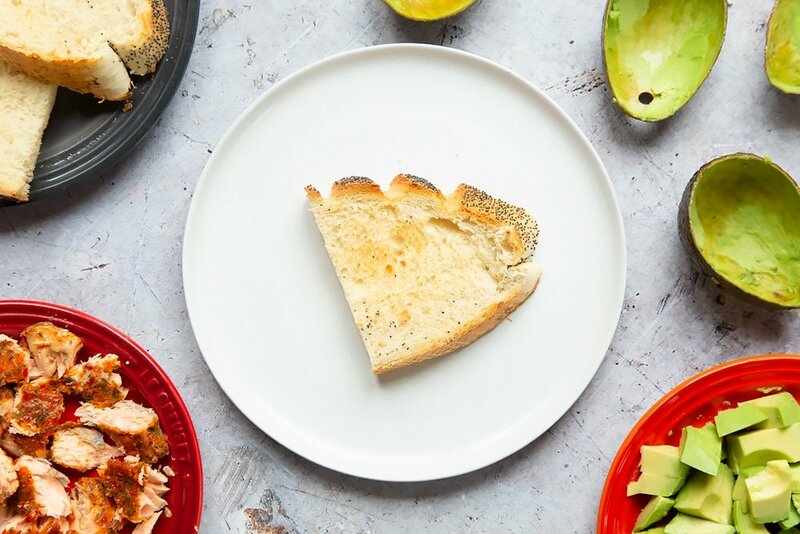 Place a piece of toast on each plate and top with the avocado and salmon. Season. Poach the eggs lightly (see my tips on poaching eggs here) and place on top of each piece of toast. Drizzle with the sweet chilli sauce that came with the salmon and serve. Isn’t that lovely? And so easy and quick! For more inspiration, check out the #SaucyChef hashtag across social media, follow The Saucy Fish Co. on Facebook, Twitter and Instagram. And don’t forget to share your own #SaucyChef creations! This looks amazing and so easy too! I don’t like avacado but everything else about this brunch is DELISH. I would never think to use those sweet chilli salmon fillets for brunch like this. This looks amazing!! I love the Saucy Fish Co products they are all so tasty! I don’t even like Salmon and even I think that this looks amazing! My husband would love this! wow this sound delicious bit so simple at the same time! My hubby loves salmon – this is going to be the Sunday brunch treat from me! Wow, this looks and sounds amazing! It has all my favourite things in it (avocado, eggs, salmon) so will definitely have to try it. This looks gorgeous Emily. I’ve never had avocado and salmon together before so really must try it. It works really well – highly recommended! 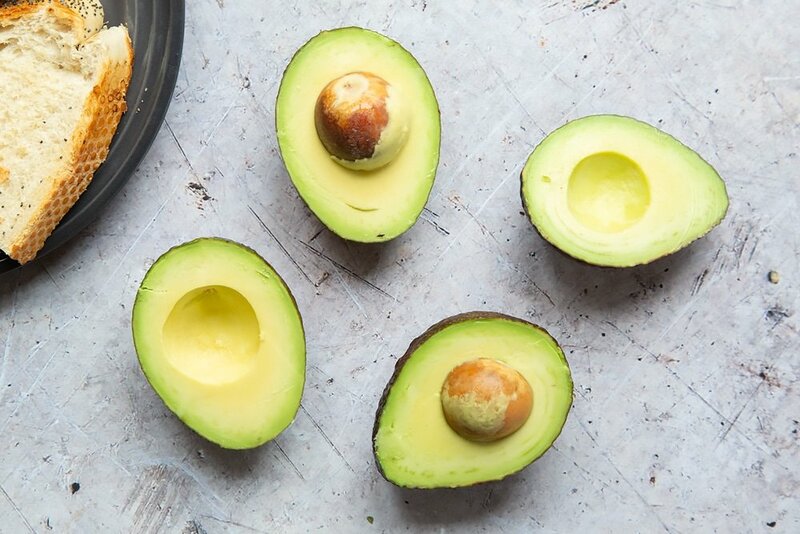 Yes I’m such a huge avo fan and had fun taking it up a notch with this recipe. This is basically my boyfriend’s dream food. Looks so yummy! I love your images I cannot stand avocado but I’m sure many people would love this. Thank you – leave out the avocado and it’ll still be super delicious with the toast, salmon and poached egg. This is such a good looking brunch. Avocado on toast is one of life’s simple joys. Always nice to jazz it up a little too. Yes, simple and yummy! Thank you! Wow! 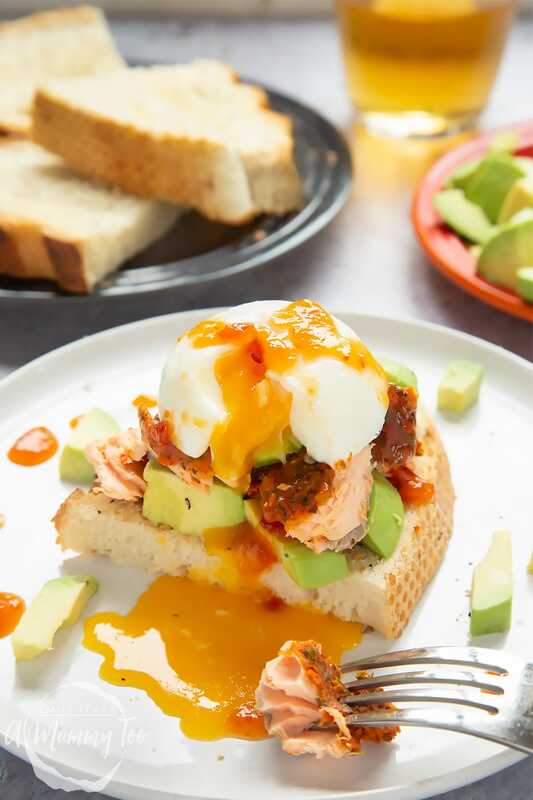 I love Salmon, eggs and avocado so I’m sure this recipe will be incredible! looking forward to trying it soon. Goodness, that all looks so tasty! I shouldn’t have read it before dinner time as now I’m craving poached egg, salmon and avocado, but all we’ve got in the fridge are leftovers. I’ll definitely be checking out the fish aisle tomorrow though! Haha! Great – I hope you enjoy! Oooo the salmon looks lovely and I do love a poached egg! It’s really good salmon – the sauce is amazing too. This looks like a great brunch recipe! I would love to try it soon! Thanks! Yes, it’s really yummy! 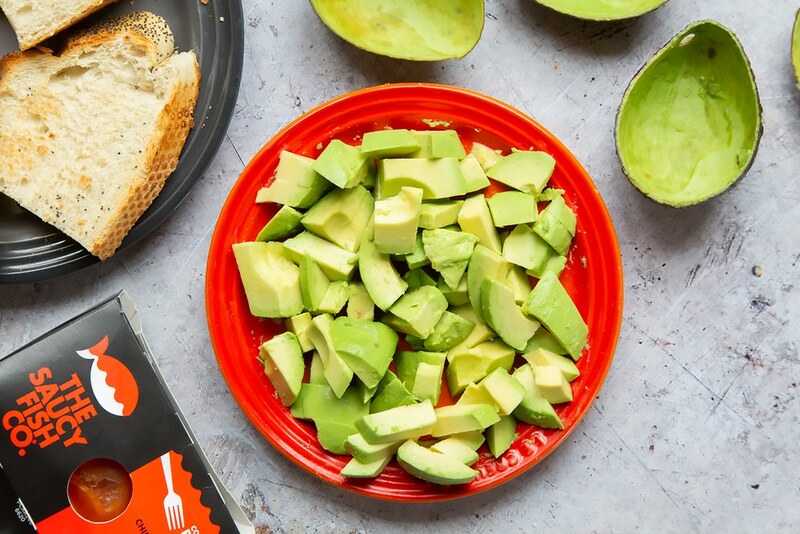 Anything with avocado sounds good. Will remember to try this at the weekend. Looks fresh. 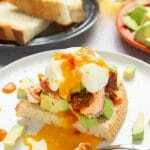 This Avocado Toast with Roasted Sweet Chill Salmon recipe sounds very yummy. Thank you! I hope you enjoy it as much as we do in our house! I just can’t get on board with avocado, despite trying it countless times. My husband goes crazy for it though and would love this I’m sure! I love salmon and this look delicious! A combination I would never think to do. Thank you! 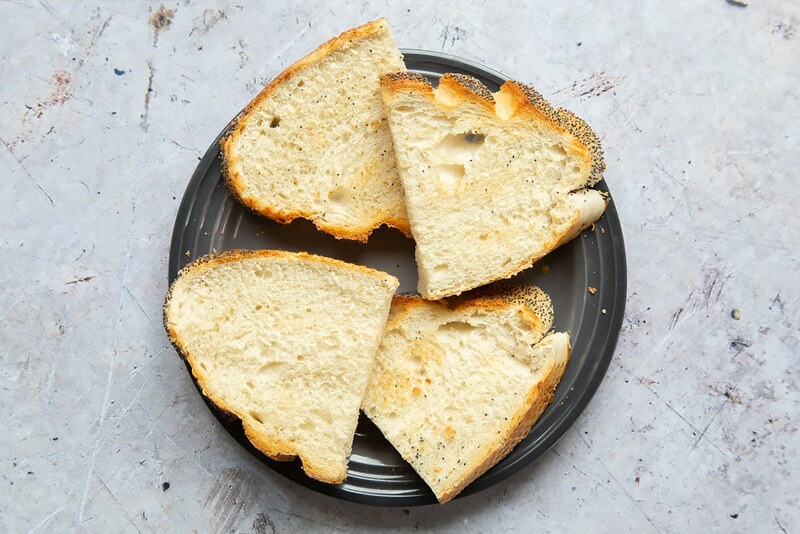 This delicious recipe is so quick and easy to make. Let me know if you give it a try! This is such a healthy and satisfying brunch/quick snack! I do hate how overpriced smashed avo dishes are in restaurants when you know you can create masterpieces like this! Thank you! My friends and family love this dish! Have you given it a try? My mouth is watering reading this. That sounds like such a delicious brunch and one I know my hubby would love. But alas I’ll have to find an alternative to the Saucy Fish Co ingredient as we have nothing like it in the supermarkets here in Portugal. Thank you! This is such a tasty meal! I hope that you enjoyed it as much as we do in our house!